The International Applicant’s Guide to a Ph.D.
For the past several years, the United States has been the go-to destination for competitive, graduate degree seeking international students. Especially in the STEM fields, large numbers of international students are choosing U.S. universities and colleges for their Ph.D. programs and research opportunities. and being an interesting place to live and study. Whatever your reason for considering international study for your Ph.D., you probably have some questions and maybe even a few concerns. In this resource, you will find information about choosing and applying to a Ph.D. program, financing your degree, navigating housing and living in the U.S., and finding resources at SMU that can help you to do all these things successfully. You will also learn from current and past international students at SMU, as they share their experiences and tips for success. Access the guide at any point by saving it to your laptop to reference while you navigate applying to graduate school. Receive this resource as an eBook! So you have decided that you want to earn your Ph.D. abroad, but with so many reputable programs available in the United States, how do you choose which graduate program is best for you? The best way to narrow down your list is through a little advanced research. Begin by compiling a list of what is important to you. Include your interests, goals, desired areas of research, and the traits that are most important to you in a graduate degree environment. Compare this list to the programs you are considering, and see how they match up. Aside from research focus and program specifics, you should also consider degree funding. If you are looking for someone to help you pay for your doctorate through a grant, scholarship, fellowship, trust, or gift of some other kind, where and how much funding you are offered can play a big role in which program you decide to choose. Another way to narrow down your choices is to consider the following question: do the program/school’s graduates have careers that I would like to have? Often, programs will disclose the jobs that their graduates went on to take, and the careers that they hold currently. This can be a good indicator of how well their degree and training prepared them to enter the field. 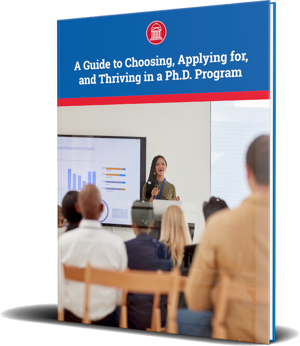 For more information on how to choose the Ph.D. program that is the best fit for you, check out our free resource — a complete guide to Choosing, Applying for, and Thriving in a Ph.D. Program. Would you like to learn more about SMU’s 32 Ph.D. graduate programs? Get in touch with the Office of Research and Graduate Studies here at SMU. Send us your information, and we will be in touch! Your application is a presentation of yourself on paper — your accomplishments, interests, research, and work experience. A strong Ph.D. applicant will meet all of the requirements for admission and will demonstrate a unique determination to advance their chosen field of study. It is important to note the application deadlines so that all your materials are submitted in a timely manner. The Test of English as a Foreign Language, or TOEFL, and the International English Language Testing System (IELTS) evaluates student’s proficiency in four areas of English language skills — reading, writing, listening, and speaking. Exams like the TOEFL and IELTS are important because they demonstrate the ability to function and learn within the English language, a necessary skill for all Ph.D. students. Your test scores must be within the past two years of the application deadline; otherwise, you have to retake the test. A TOEFL/IELTS score is required of all international applicants from countries where English is not the native language. For more information on the guidelines surrounding testing, including minimum score requirements for admission at SMU, please visit the international applicant page of the Office of Research and Graduate Studies at SMU. Know the test format: become familiar with the standard number of questions and sections as well as the length of the test and the types of questions that will be asked. Create a study plan: come up with specific strategies for learning to speak, read, write, and listen in English. Take as many practice tests as you possibly can: by taking practice tests, especially ones published by the testing companies themselves, you will help familiarize yourself with the material. Set a goal score: if you set a goal, this goal will keep you motivated, focused, and will help you measure your progress throughout your time taking practice tests. Enlist support: ask family, friends, tutors, and anyone else to help you practice your English language skills. Retake the test: trying again is an option if you leave enough time to pay for and retake the test. Many graduate programs in the United States, require students to submit official scores from the Graduate Record Examination (GRE). The GRE is a test that measures a student’s proficiency and skills in several areas, necessary for graduate education. The test focuses on three areas of competency: verbal reasoning, quantitative reasoning, and analytical writing. To succeed in taking the GRE, students should study the structure and scoring methodology of the test. Students have the option to take the test on paper or online, and should choose the arrangement that works best for them. The test is offered in more than 160 countries, and 700 test centers around the world administer it. Results can be sent electronically to the program of your choice (SMU’s code is 6660). Taking the GRE (within five years of application) is required for most graduate programs. In some programs, students with exceptional scores may even be eligible for additional funding opportunities. A video essay is required for all SMU Ph.D. applicants that submit TOEFL/IELTS scores and have received a TOEFL speaking score below 23, or an IELTS speaking band below 6.5. For any international applicant that earns a higher score on their English language placement exam, the video essay is optional, unless applying to the Statistics or Biostatistics program. Students should not be nervous about the video essay portion of the application. This is an opportunity for you to speak directly to your admissions committee via a recorded response about your passions and strengths. The best thing students can do to prepare for the video essay is to practice a lot and to think about it like a job interview. Unofficial transcripts are accepted and can be uploaded to your application for the review phase. Upon admission to SMU, you will need to send official transcripts, certified and translated if from a foreign institution, directly from each school of higher education you attended. Applicants must also provide a copy of their diploma in the original language and in English. The translation of these documents should effectively and accurately explain the title of the course from its native language, so the faculty can understand what it is. As part of your application, you will need to submit three letters of recommendation. When choosing the three individuals who will write your letters of recommendation, you should choose people who know you well and can speak specifically to your accomplishments. Unless you have specific and extensive work experience in your chosen field, the best recommendations for Ph.D. applicants are from academic references. Be sure to provide them with all the materials they need to craft your letter and plenty of time to submit it before the deadline. Learn all there is to know about pursuing your Ph.D. by downloading this additional guide! Once admitted, international students must provide a Certification of Finance Form or Letter of Financial Backing as evidence of financial support. A Letter of Financial Backing may be signed by a parent or sponsor, but must be certified by a bank. These documents must be notarized and on file with the university to begin the process of obtaining an I-20, as well as a visa and passport. There are several different options for funding your Ph.D. degree, the most common of which include: fellowships, teaching and research assistantships, grants and scholarships, and loans. This section will briefly describe the differences between each, what SMU offers in terms of these different options, and resources for finding and applying for each type of funding. Fellowships are gifts of money, offered by either the university or external benefactors, that are commonly given to students as a merit-based award. This gift of funding can last anywhere from one year to the whole duration of a student’s Ph.D. program. Fellowships are frequently used to sponsor a student and fund proposed research, that will advance their specific area of research. At SMU, graduate fellowships are available at the university level and are awarded on a competitive basis for both merit and need. If the program offers departmental funding, then the student is considered at the time of application. Sometimes additional documentation is required, in which case the department will contact the student directly. You can also research additional external fellowships through websites such as ProFellow and GoGrad. At SMU, teaching and research assistantships are available through the departments. Teaching assistantships are positions in which students support department faculty members in their various courses. Some of these positions will involve work helping the professor prepare materials for the class, and in some cases you may be asked to teach the class yourself. Research assistantships are similar, in that you will support a department faculty member in their lab and research while receiving compensation, but you will most likely not be involved in classroom interactions. Similarly to fellowships, they are awarded on a competitive basis for both merit and need, and students are considered for these opportunities at the time of their application. Assistantships provide stipends for designated work in the departments and are able to cover a student’s tuition and fees in some instances. Grants and scholarships are similar to one another. They are money provided by either private or public institutions that will not need to be paid back after you finish your Ph.D. These types of funds are usually earmarked for students from a specific ethnicity, countries, or with particular skills or other qualifications. The best way to take advantage of grants and scholarships is to begin your research early and apply for as many as possible. International students are not eligible for U.S. Government grants, but you can find grants and scholarships for specifically for international students on websites such as GreatCollegeDeals and CollegeScholarships.org. Private loans are offered to international students through a variety of different financial institutions. Like all private education loans, students can borrow up to the total amount of the cost of their education and education related expenses after financial aid is applied. The student is responsible for repaying the loan with interest to the lender upon degree completion. You will need to apply for these loans, which will include providing the lender with some financial information. Frequently, international students applying for loans will be required to have a creditworthy cosigner on the loan who is a U.S. citizen or a non-citizen permanent resident. You can use websites such as International Student Loan and IEFA to help you find and compare loans, interest rates, and repayment plans. Every international student is required to file a tax return if they were in the US during the previous calendar year. These need to be submitted by April 15th of each year. You must file a tax return (or in some circumstances Form 8843) to comply with an F-1 visa, even if you didn’t earn any money in the US. For more information and resources regarding filing taxes, purchasing access codes, and obtaining the correct paperwork, contact the Office of International Student and Scholar Services. You will need to acquire several documents to legally study in the United States. At SMU, our Office of International Student and Scholar Services works with students directly to process their visa paperwork. The office will contact them directly through email to help them get their paperwork in order and remind them of what is still missing. After being accepted by SMU, a Student and Exchange Visitor Program (SEVP) certified school, you will begin the process of filling out your paperwork to come and study in the U.S. Follow this easy step-by-step list to ensure you take all necessary action. After one full year of study, you will be eligible to take an annual vacation. Students who wish to find part-time employment must speak with their DSO first to ensure that they meet all the necessary requirements. Change your major, program, or degree level. Transfer to a new school or take a leave of absence. Take a break from school. Travel outside the United States. Move to a new address. Advancing the Field is a weekly blog that offers prospective graduate students insight and advice as they consider the challenges and exciting possibilities that come with getting a graduate degree. Ready to Read More? Subscribe to Our Blog Today! 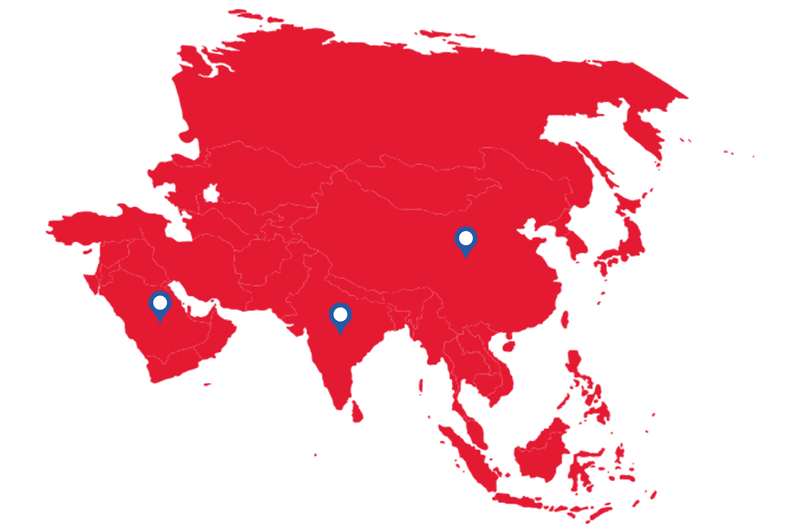 SMU offers several resources to international graduate students designed to make their time here more comfortable, enjoyable, and safe. We understand that being thousands of miles away from home can be difficult, and we want to make your experience at SMU as fulfilling as possible. From a place to live, to a place to go when you get sick — these resources will help Dallas feel like a home to you while you earn your Ph.D.
All international students are required to have hospitalization insurance and must show proof of their insurance at the time of registration. Coverage may be obtained individually through private institutions, or through the university. Students who have purchased insurance through the university have access to the Student Health Center. The Student Health Center has fees of approximately $120 per semester and covers all services offered including comprehensive, quality healthcare, medical services, counseling services, and health education. For more information about healthcare coverage and health insurance requirements for international students, contact the International Advisors' Office (smuvisa@mail.smu.edu). At SMU, there are both on-campus and off-campus housing options for graduate students. The on-campus housing option for graduate students, seniors, or non-traditional age students, are rooms in Martin Hall. To apply for on-campus housing, contact the Office of Residence Life and Student Housing (housing@smu.edu). SMU is centrally located in the heart of Dallas, Texas, just miles from the city center. Dallas is a cosmopolitan city and home to large groups of individuals from several different nationalities and backgrounds. In our experience, international students have no problem feeling right at home, with many grocery stores, restaurants, and cultural centers that offer a little taste of their home country. Once you get to Dallas, be sure to take some time to explore the area, find places where you can buy your favorite food, and experience familiar music and art. Dallas is a large, popular, and easily accessible city, which makes getting to and from SMU a simple task. There are two major airports in the Dallas area: Love Field and Dallas/Fort Worth International Airport. DART is the transportation system that gets you around Dallas, Texas, and 12 surrounding cities in the DFW area. SMU participates in a DART Higher Education Pass Program and all currently enrolled students are eligible to receive an annual DART transit pass through the Parking and ID Card Services Office. The SMU Express and Museum Express shuttles are free to all students and do not require a DART Transit Pass to ride. Tell us a little about where you are from and your educational background. I am from India. I completed my BS in Biotechnology and MS in Biomedical Genetics in India. After my master’s degree, I worked for four years in India detecting genetic abnormalities in cancer and infertility patients. I also taught genetics to medical professionals, including nursing and medical students. What was your primary motivation for applying to an international graduate school? After working for four years in the medical industry and education sector, I felt that my career progression had come to a stand—still, and in order to achieve higher goals I would need a doctoral degree from the United States. I chose the US because of better available laboratory infrastructure, state of the art scientific equipment, and a higher quality of research when compared to other countries. What made you choose SMU over other schools? I was interested in the Molecular Virology and Cancer Research carried out by Dr. Harrod’s laboratory at SMU. I also found other labs in the Dedman College interesting, and the small department size indicated more personal attention to students and their research projects. Was there anything you found challenging about applying to an international school? Since I had a long gap in between completing my master’s degree and applying for a Ph.D., I found it challenging to convince international schools of my motivation and keen interest in further studies. Choosing the right fit in terms of a school, department, and most importantly, the laboratory that I would spend at least 5 years in was a very crucial decision to make. Is there any advice you would give an international student applying to SMU? I found everyone at SMU very approachable and friendly. The department and the Graduate Studies Office always supported me in everything I needed, and I am greatly indebted to them. Most of the time, you only need to go and talk to someone. Once you do that, they are always there to help. What has been your favorite part of attending an international school? It was great to make friends with students from across the world and be a part of a new culture. I learned a lot from living in another country, and got some very valuable exposure that has definitely added to my personal and professional skills, and my personality as a whole. My circle of best friends includes individuals from Ukraine, Iran, Turkey, and Sri Lanka. How cool is that! Is there anything you have found difficult about attending an international school? Sometimes it’s hard to explain your point of view, since you are from another country that is very different. But with patience and a little hard work you can overcome these issues. You will have to constantly put effort into learning new things in a new place, but it’s all a part of the international exposure that will help you achieve so much in life. What is one thing you would recommend doing in Dallas, to all international students attending SMU for the first time? I loved Dallas. It’s the easiest city to live in. Don’t miss out on amazing Tex-Mex food while here! Is there any advice or wisdom you would pass along to prospective international graduate students? Never underestimate yourself or your country, and don’t allow anyone else to do it either! Be proud of where you come from and how far you’ve come. At the end of the day, it’s those roots that made you the person you are today, the rest of it is what you acquired on this journey of life! There are several offices at SMU that are designed to support international students, and meet their academic, professional, and personal needs while they pursue their Ph.D. Check out these helpful resources, and don’t hesitate to contact these offices if you have any questions before or during your graduate education. SMU has one off-campus and six on-campus libraries that offer students a wealth of opportunity for study, research, and scholarly pursuit. The library system at SMU also offers an online scholarly database with peer-reviewed articles and research that is accessible to all SMU students. One particularly useful resource for graduate students, is the graduate student lounge located in Fondren Library Red Room 320. Earning your Ph.D. in the United States is a life-changing experience, which can open up numerous doors to cutting edge research opportunities, and connect you with the leading academic experts in your field. 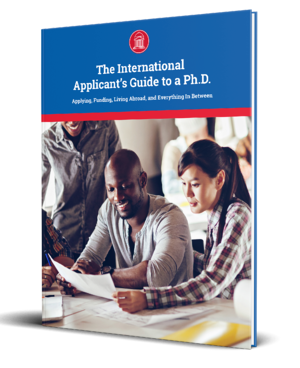 We hope this guide has provided you with the information you need as you pursue a Ph.D. in the United States as well as specific information about the application process for international applicants at SMU and the resources SMU offers to international students. Are you still curious about what the next step towards grad school should be? Want to learn more about SMU’s 32 Ph.D. programs?